It’s little wonder that Suzuki’s success in making great small cars is rubbing off on the buyer’s perceptions. Recent fresh Suzuki designs like the exciting Suzuki Kizashi, the modern Grand Vitara and the tidy new Alto have been the talk over the coffee tables at various journalist meets. So it’s with excitement and anticipation that I get to review the brand new Suzuki S-Cross. A walk around the S-Cross reveals a distinctive, crisp design that, though compact, is striking and good looking. Similar bold panelling is suggestive of the Suzuki Grand Vitara – only on a smaller scale. So it looks the goods on the outside; what about the inside? It doesn’t take long to appreciate that the cleverness in roomy storage compartments, spacious seating and fun style are all going to add up to make this a small car that’s going to be enjoyable to live with. A CD player with USB connectivity, and loud four-speaker sound with tweeters, means you can simply plug in you iPod unit and play all your favourite songs to your hearts content. One of the great things about the new Suzuki S-Cross is that the moment you sit in the S-Cross seats, everything just falls into place and feels right. It’s a car that just seems to fit and feel good when you slip into the driver’s seat. I like the modern shape of the S-Cross dash and centre console, while the steering wheel fits snugly into both palms. Blue back-lighting for the instrument cluster looks current and elegant, and the leather seats in the higher spec model is classy and attractive. Occupants in the front and rear will enjoy the S-Cross experience that offers a supple ride and comfortable seating for five. Suzuki S-Cross models all boast impressive features. 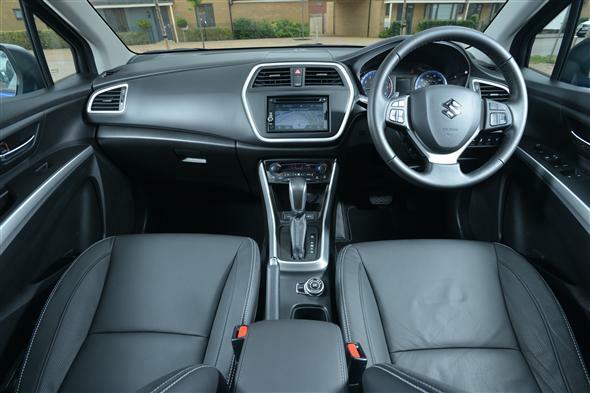 Even the Suzuki S-Cross GL comes with cruise control, bluetooth communications, an optimum safety system, seven airbags, and an Electronic Stability Programme (ESC). Move up to the GLX Prestige and there is no lack of luxury, at all. Electric windows, leather seats, seven speakers, a sunroof and reversing camera are all standard items. On the road, the Suzuki S-Cross is nice and stable and remains supple over heavy road undulations. The steering is nice and responsive, keeping itself light and easy in tight city manoeuvres. On the go, the 1.6-litre engine is responsive, keeping up with all the road speed limits without complaint. When extra get-up-and-go is required, the S-Cross is happy to punch past slower traffic without a sweat. Engine performance comes from a lively 16-valve, four cylinder engine that puts out a maximum of 86 kW at 6000 rpm. Maximum torque is a little light at 156 Nm, but useful enough, and is found in the mid-range – so you do need to keep the revs up to get the most from the engine. A five-speed manual gearbox is available on the GL model only, and I actually like this one by preference. You might call me a little on the old-fashioned side, but the simple five-speed manual links really well with the peppy little engine. The other alternative throughout the S-Cross range is the smooth acceleration of the CVT set-up. A gated 7-speed CVT option is also available for the Suzuki S-Cross GLX AWD and GLX Prestige. Gone are the days where Suzuki, along with other Asian cars, skimped on safety features. The new Suzuki S-Cross is loaded with premium safety features to make the car a very safe small family car. No ANCAP safety results have been done on the S-Cross at the time of writing, however the 5-Star rating for the Suzuki SX4 and Swift make a pretty safe bet that the latest Suzuki S-Cross will be every bit as good. Would I buy one? You bet. With a fuel consumption figure of under 6 litres/100 km you’re going to go along way between fuel stops. The blend of room, style, economy and reliability make for a pleasant drive. The all new S-Cross is inspirational, helping you to get on with packing the most into every day. For any more information on the Suzuki S-Cross, or for that matter any other new car, contact one of our friendly consultants on 1300 303 181. If you’d like some fleet discount pricing (yes even for private buyers! ), we can submit vehicle quotes requests out to our national network of Suzuki dealers and come back with pricing within 24 hours. Private Fleet – car buying made easy!